I have made several dozen turnouts in various configurations with both Code 83 and Code 100 rail using Fast Track jigs, fixtures and paper templates. This includes 10 double-slip switches that Bill Payne and I made for my layout, his layout and our Nottawasaga Model Railroad Club freemo modules on the previous club layout before our move to Bygone Days in Collingwood (2015). I was told recently that the modeller helping Rod Stewart build his model railroad used Fast Track tools. That's a better star endorsement of the process than mine. However, I am pretty comfortable tackling these switches now. The photos on this page are in-progress shots of the staging area under my earlier HO Utopia Northern Railroad. The process for constructing turnouts is well documented and explained in text and in videos on the Fast Track website. These are some general comments based on my experience in making handlaid turnouts. I bought the jigs for both #5 and #6 standard gauge HO turnouts. They come ready to build either a left or right. I also have the jig for a #5 double-slip. It is easier to start with the jigs because they are so accurate. 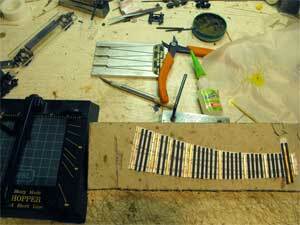 I can make a standard turnout using a Fast Track jig in about an hour. A complicated double-slip takes six to eight hours. I recommend buying the jig for the most common turnout you plan to use. Once you get the hang of it you can try building turnouts using only the free paper templates. I have now built a number of curved turnouts including two turnouts built as a single unit in order to close up the frog of the first one to the points of the second one. The beauty of the templates is that you can try different combinations on your benchwork until you find the arrangement you like best before cutting any rail. Make sure you print them at 100%! The rail bender is indespensable for the critical rails in a double-slip. It also makes forming curved point rails a breeze. It is possible to bend lighter rails with your fingers if you're careful. If I could only afford one tool I'd buy the frog and point tool for the kind of turnout I want to build. Mine takes Code 70, 83 and 100 rail. 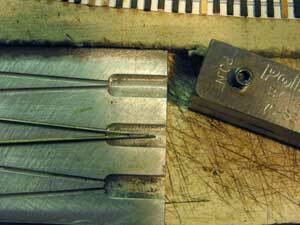 Tip: I have a habit of filing off the inside of my index finger when shaping the ends of points, frogs and guard rails. I now put a small bandage on the tip of my finger before I start filing. I find that it's better to spike the rails before soldering when using the paper templates. I white glue the template to a piece of homasote and ACC the circuit board ties to the template. Check electrical continuity before gluing. Give them a light sanding to help with soldering. Eyeball the initial placement of the rail using the printed rails on the template as a guide. Make your final adjustments with an NMRA track gauge. I also have several 3-point gauges that help to hold the rails in position. They are Code 70 gauges, but after years of use they are worn enough to be used for Code 83. 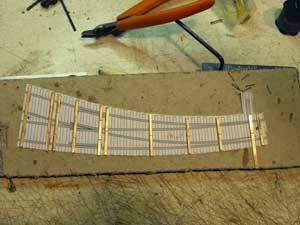 When using paper templates I cut Micro-Engineering wood-stained ties in a North West Shortline Chopper and glue them with carpenter's glue to the paper templates before adding the rail. If I'm using the Fast Track fixtures, I spray paint the Twist Ties with roof brown [or equivalent matte brown spray paint] before gluing the rails in place with Goo or Pliobond. I touch up later by hand. One departure is that I prefer to use the thinner and wider Clover House circuit board throwbars. It makes drilling holes for ground throws easier. I've had package of these Clover House ties hanging around for years. A Point & Frog filing jig is shown at the top right in the photo. 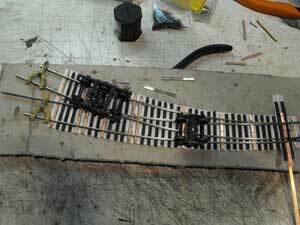 Cut and lay the rail using an NMRA gauge to get everything right, especially in the critical frog area. Take your time here. Run a set of wheels back and forth through both legs to be sure they don't pick at the frog. I do this before putting in the guard rails. The guard rails will make it even better. The wheels on the trucks should not drop into the frog and should pass through without binding. Then solder all the rails in place and check again. Here you can see I'm checking the gauge with both a six-wheel and a four-wheel truck. The 3-point gauges hold the rail ends in place. I also have a see-through Micro Mark 40-foot freight car that I use to check the gauge. You can see it above The Chopper in the second photo above. I added some stick-on weights to the NMRA standard weight for a 40-foot car. After cutting the gaps as explained on the Fast Tracks website, I take the rails and paper assemblies to the garage and spray paint them with Floquil roof brown. Tie brown if I can find it. If I've used the fixtures I spray the rails first with Floquil rail brown before gluing to the ties. Now that Floquil has been discontinued I'll substitute another matte brown spray paint. Tip: Rub a piece of leftover cork roadbed along the rail tops immediately after spray painting the track. It's a lot easier to remove most of the paint from the rail tops before the paint dries. A PECO, Walthers, or other type of eraser can be used to clean up spots you miss. I like the effect of handlaying turnouts and track. It takes longer but it looks better and it works better. If you're doing more than a few turnouts it can save you money. Go from "handlaid-turnout" to DCC frog wiring. Go from "handlaid-turnout" to manual turnout control. Go from "handlaid-turnout" to servo control of turnouts with Tam Valley stationary decoders. Return from "handlaid-turnout" to my Home Page.